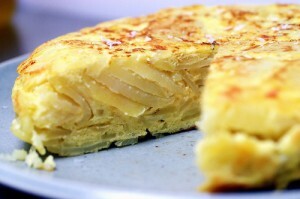 Spanish Ommlette recipe by Mrs Imran (Ksa) at PakiRecipes.com. Add 1tb milk n salt pepper n beat it. In a non stick fry pan put some oil and add potato slices n fry it till it give soft look. Then add eggs and all the vagetables one by one. Cover pan for 3 to 4 mins leave it on slow heat. Then turn the ommlette n cook for atleast one min and serve with cheese slices n tomato ketchup.